The dedicated resource is the named individual who works full time with clients specific projects as a team resource. The person reports in full to the client for all regular daily business – like a distance worker on a satellite office. We offer a wide spectrum quality web development and programming service. From the simple representation websites, to large, extensive functionality web projects. All web projects are based on modern content management systems and responsive (adapted to desktops, tablets and smartphones screen sizes). Developed web sites work, and look great, across every platform. We provide smart e-commerce and business management systems for all needs – from simple eshops till online booking services and other smart IT solutions – payments, couriers service integrations, stores network or warehouse management systems and many more. Understand, plan & develop – 3 key words to successful business process transfer from paper to online solution. Everything you will find here – just contact us. Our team of professionals will provide the best solution to your business which increase your competitiveness and profitableness. Mobile applications (APP) will move your business to the next level. Smartphones are big part of our life so lots of companies just must have APPS. Mobile applications allows provide better services and stay as close to the customers as possible. This is why we providing native Android, iOS, and Windows apps. If you can’t be found on Google, you does not exist! Your online business or web site optimisation for Search engines is important but often missed. We strongly recommending to contact us so we could help and make sure, that flow of visitors and sales will be increased in your online project. Special offer for senior front-end developers! 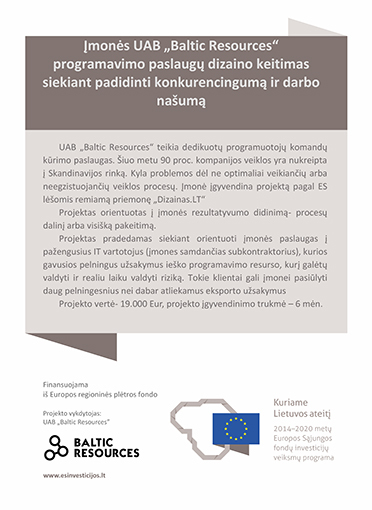 UAB “Baltic Resources” is a Swedish capital Europe-oriented technology consultancy founded in 2010. We can provide all web & mobile solution or dedicated resources to your project. © 2019 Baltic Resources. All rights reserved.